Mafia hits, scandal, celebrity, subterfuge, Vegas. 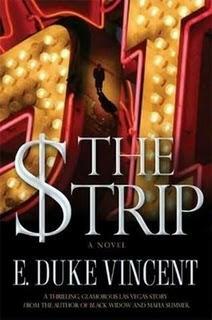 The $trip by E. Duke Vincent seems to have all you would want in a guilty pleasure read. Though given all of the possibility that should have been building throughout the book, it was a bit of a let down. The main character, Nick Conti, is a TV producer on the show The $trip. A couple of low-level Chicago mobsters are blackmailing the show, promising to shut down production if a cut of the shows profits are not handed over. Conti himself has connections from his past to the Kansas City mob. He is currently known in Vegas as a womanizer who prefers to keep out of the spotlight. Arson on the set of Conti’s show and the attack on one of the stars brings out the journalists sniffing around for a story. Conti is the one who has to deal with all of it. There are numerous plot twists that don’t add to the book’s sense of excitement or suspense. Conti’s old flame, Erin Conroy, pops up connected to a movie producer with his own separate ties to the mob. One plot line that should have been developed further is the angst that Conti reportedly went through in returning to his mob roots as the book ends. The book is well-researched, and I have no doubt that the situations and characters presented are true to life. Vincent was a producer of a number of popular shows including Beverly Hills 90210 and 7th Heaven. I feel that this book would work better on the screen; unfortunately, the writing doesn’t have the excitement of Vincent’s TV shows. I had figured that there would be more suspense and scandal involved in the story, and it just fell flat. Throughout the book, women are essentially objects. The lead female character, Erin Controy, is noted for her waistline, leg length, and sexiness. She is not fleshed out as an actual character; all that is focused on is her flesh. For a casual guilty pleasure read (particularly someone who appreciates seeing women portrayed as actual women as compared to bits of meat), you could do better. For a book on scandal in Vegas or the mob, you could do better. For a start of a movie script, it’s not bad.